Lieutenant Richard H. Schiebel’s Last Flight. 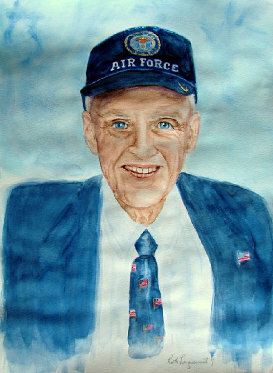 The column I wrote for texasescapes for May, 2007 was about a Korean War hero, Lt. Col. Richard H. Schiebel. If you didn’t read it, I’d like for you to read it now. On Saturday evening, the 7th of August at 10:00, Schiebel told his stepson, who was holding his hand, “Jim, I’m leaving now to go to be with Judy.” Within a few moments he drew his last breath. He was 88. After the Korean War, Col Schiebel became a coach at Galveston’s Ball High School. I was a student there at the time, so you’ll both understand and forgive me for referring to him as Coach throughout the remainder of this piece. Coach had flown many dangerous missions and had survived a lot of enemy fire. He even brought his plane in and landed it on an aircraft carrier. There was a huge hole that had been blown in the plane’s canopy, almost blinding him as the plastic fell all over him. In later life, he made it through two serious cancer operations, and managed to live a productive life for nearly twenty more years. His brain cells never left him. He was as bright and smart at 87 as he had been in his twenties. My longtime friend, Ruth Evans Lacquement and her husband Robert went to see Coach the Friday before he died. Ruth decided to paint a picture of Coach so that they could give it to him. She told me she had never been able to do anything that fast and accurately. It took her only two hours. It was the work of God, she assured me. Coach was very pleased. Jim taped it to the wall in front of Coach’s bed so that Coach could see it whenever he wanted. Robert asked Coach if he could see his service ribbons and metals. Jim took them out of the nearby drawer and handed them to Robert. There was an impressive number. “May I have one of them to remember you by?” Robert, an ex-Marine, asked. When Robert found the one he liked best, he began bragging on the valor that it had taken for Coach to earn it. Coach whispered again, “Let me see it.” Robert handed it to him, then Coach stuck it in his own ear. It was Coach’s way of letting Robert, Ruth and Jim know that being able to receive those ribbons wasn’t what was important to him. What was important to Coach was that he had risked his life to protect America from the enemy. It was time to leave. Robert touched Coach’s shoulder and told him that he and Ruth would be back the next Friday. Ruth kissed Coach’s cheek, knowing in her heart that it would be the last time they would see him. It was the next evening that Coach died.